Sustained giving is vital to the financial health of a non-profit like ACMS, because it gives us support for our programs that we can rely on throughout the year. Donations of any amount given monthly or annually enable you to become a member of our Key Club. The Key Club supports our Harmony Initiative, which benefits the collective ACMS Community Partnership Programs throughout Austin. Each program provides the city’s most vulnerable members with musical experiences that promote healing and creative expression. The Harmony Initiative directly serves all ages – infants, school-aged children, teen parents, adults, veterans, and the elderly. Your support is critical to our mission now more than ever! Becoming a sustaining member of The Key Club is easy. Simply Make a Donation online or call the Registrar at (512) 474-2331 to set up your automatic monthly or annual donation. Contributions of all amounts are most welcome, and letters confirming your tax-deductible gift will be sent to you. 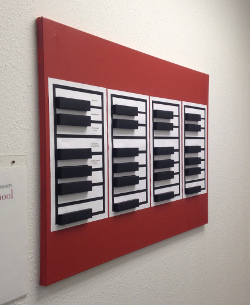 Your name, or the name of anyone you want to honor, will be placed on a piano key on our beautiful Key Club wall display.